Using gravitational "lenses" in space, University of Utah astronomers discovered that the centers of the biggest galaxies are growing denser -- evidence of repeated collisions and mergers by massive galaxies with 100 billion stars. "Most recent studies have indicated that these massive galaxies primarily grow by eating lots of smaller galaxies," he adds. "We're suggesting that major collisions between massive galaxies are just as important as those many small snacks." The new study -- published recently in The Astrophysical Journal -- was conducted by Bolton's team from the Sloan Digital Sky Survey-III using the survey's 2.5-meter optical telescope at Apache Point, N.M., and the Earth-orbiting Hubble Space Telescope. The telescopes were used to observe and analyze 79 "gravitational lenses," which are galaxies between Earth and more distant galaxies. A lens galaxy's gravity bends light from a more distant galaxy, creating a ring or partial ring of light around the lens galaxy. The size of the ring was used to determine the mass of each lens galaxy, and the speed of stars was used to calculate the concentration of mass in each lens galaxy. Bolton conducted the study with three other University of Utah astronomers -- postdoctoral researcher Joel Brownstein, graduate student Yiping Shu and undergraduate Ryan Arneson -- and with these members of the Sloan Digital Sky Survey: Christopher Kochanek, Ohio State University; David Schlegel, Lawrence Berkeley National Laboratory; Daniel Eisenstein, Harvard-Smithsonian Center for Astrophysics; David Wake, Yale University; Natalia Connolly, Hamilton College, Clinton, N.Y.; Claudia Maraston, University of Portsmouth, U.K.; and Benjamin Weaver, New York University. The new study deals with the biggest, most massive kind of galaxies, known as massive elliptical galaxies, which each contain about 100 billion stars. Counting unseen "dark matter," they contain the mass of 1 trillion stars like our sun. "They are the end products of all the collisions and mergers of previous generations of galaxies," perhaps hundreds of collisions," Bolton says. Despite recent evidence from other studies that massive elliptical galaxies grow by eating much smaller galaxies, Bolton's previous computer simulations showed that collisions between large galaxies are the only galaxy mergers that lead, over time, to increased mass density on the center of massive elliptical galaxies. When a small galaxy merges with a larger one, the pattern is different. The smaller galaxy is ripped apart by gravity from the larger galaxy. Stars from the smaller galaxy remain near the outskirts -- not the center -- of the larger galaxy. "But if you have two roughly comparable galaxies and they are on a collision course, each one penetrates more toward the center of the other, so more mass ends up in the center," Bolton says. Other recent studies indicate stars are spread more widely within galaxies over time, supporting the idea that massive galaxies snack on much smaller ones. "We're finding galaxies are getting more concentrated in their mass over time even though they are getting less concentrated in the light they emit," Bolton says. He believes large galaxy collisions explain the growing mass concentration, while galaxies gobbling smaller galaxies explain more starlight away from galactic centers. "Both processes are important to explain the overall picture," Bolton says. "The way the starlight evolves cannot be explained by the big collisions, so we really need both kinds of collisions, major and minor -- a few big ones and a lot of small ones." The new study also suggests the collisions between large galaxies are "dry collisions" -- meaning the colliding galaxies lack large amounts of gas because most of the gas already has congealed to form stars -- and that the colliding galaxies hit each other "off axis" or with what Bolton calls "glancing blows" rather than head-on. The University of Utah joined the third phase of the Sloan Digital Sky Survey, known as SDSS-III, in 2008. It involves about 20 research institutions around the world. The project, which continues until 2014, is a major international effort to map the heavens as a way to search for giant planets in other solar systems, study the origin of galaxies and expansion of the universe, and probe the mysterious dark matter and dark energy that make up most of the universe. Bolton says his new study was "almost gravy" that accompanied an SDSS-III project named BOSS, for Baryon Oscillation Spectrographic Survey. BOSS is measuring the history of the universe's expansion with unprecedented precision. That allows scientists to study the dark energy that accelerates expansion of the universe. The universe is believed to be made of only 4 percent regular matter, 24 percent unseen "dark matter" and 72 percent yet-unexplained dark energy. 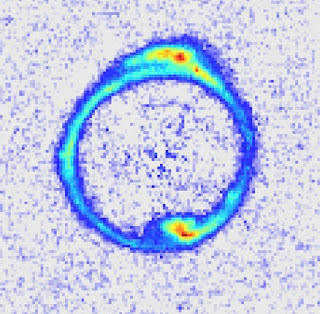 During BOSS' study of galaxies, computer analysis of light spectra emitted by galaxies revealed dozens of gravitational lenses, which were discovered because the signatures of two different galaxies are lined up. - The Sloan Survey and the Hubble Space Telescope collected images and emitted-light color spectra from relatively nearby, older galaxies -- including 57 gravitational lenses -- 1 billion to 3 billion years back into the cosmic past. - Another survey identified 22 lenses among more distant, younger galaxies from 4 billion to 6 billion years in the past. The rings of light around gravitational-lens galaxies are named "Einstein rings" because Albert Einstein predicted the effect, although he wasn't the first to do so. "The more distant galaxy sends out diverging light rays, but those that pass near the closer galaxy get bent into converging light rays that appear to us as of a ring of light around the closer galaxy," says Bolton. The greater the amount of matter in a lens galaxy, the bigger the ring. That seems counterintuitive, but the larger mass pulls with enough gravity to make the distant star's light bend so much that lines of light cross as seen by the observer, creating a bigger ring. If there is more matter concentrated near the center of a galaxy, the faster stars will be seen moving toward or being slung away from the galactic center, Bolton says. - Gas that is collapsing to form stars can increase the concentration of mass in a galaxy. Bolton argues the stars in these galaxies are too old for that explanation to work. - Gravity from the largest massive galaxies strips neighboring "satellite" galaxies of their outskirts, leaving more mass concentrated in the centers of the satellite galaxies. Bolton contends that process is not likely to produce the concentration of mass observed in the new study and explain how the extent of that central mass increases over time. - The researchers merely detected the boundary in each galaxy between the star-dominated inner regions and the outer regions, which are dominated by unseen dark matter. Under this hypothesis, the appearance of growing galaxy mass concentration over time is due to a coincidence in researchers' measurement method, namely that they are measuring younger galaxies farther from their centers and measuring older galaxies closer to their centers, giving an illusion of growing mass concentration in galactic centers over time. Bolton says this measurement difference is too minor to explain the observed pattern of matter density within the lens galaxies.